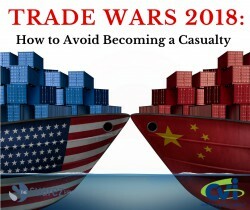 In response to the controversy and uncertainty surrounding the wave of provisional tariffs implemented this year under President Trump’s administration, CVI partnered with recognized trade attorney, Ms. Evelyn Suarez, owner of The Suarez Firm in Washington D.C., for an educational webinar held on July 25th entitled “Trade Wars 2018: How To Avoid Becoming A Casualty.” CVI Vice President & General Manager Venetia Huffman served as moderator and Marketing Coordinator Jessica Lonsdale provided technical and administrative support. Some 100+ registered participants from a variety of industries were given a comprehensive background on the platform for the tariffs, a tutorial on the intricate web of products and percentages, a briefing on how the NAFTA program could be altered, strategies for circumventing duty liabilities under the new tariffs, and what the future may hold for their retention and expansion. At the conclusion of the webinar, participants were given the opportunity to answer a brief survey of the event. The positive responses we received prompts CVI to offer future events in an effort to keep the import and export community informed on critical trade topics. , if you would like to access the recorded webinar or any of the follow-up documents.